Is My Baby Teething? Teething Signs to Watch For! One of the hottest topics in parenting has always been teething babies – for good reason, teething is hard on the baby and parents alike. Furthermore, it can be hard to tell what’s teething and what’s just normal baby fussiness. As your child quickly goes from a newborn to a teething babe, you might finding yourself looking for teething signs to pinpoint the cause of discomfort. In this blog, we’ll cover baby teething signs and a typical baby teething schedule to help you determine if your babe is going through a teething phase. While no two babies are the same, there are many common teething signs that babies display when a new tooth is about to erupt. If you notice your baby experiencing one (or several) of these symptoms, a new tooth might be on the horizon. Increased drool is one of the first signs of a teething baby. This can help the baby relieve some of the pressure they’re feeling and prepare for the new tooth. The increased drool often results in diarrhea and diaper rashes as well. The drool can also be the culprit of rashes around the mouth, as the skin is irritated by the constant moisture. More biting, increased sucking, and a propensity to put things in their mouth to chew on helps the baby relieve pressure on their gums. Some babies pull on their ears as a way to relieve the pressure they feel in their mouth, especially for the back molars. Teething can cause a worsened sleep, as your baby may be in pain and unable to fall or stay asleep as a result. Irritability is a common teething symptom parents report when it comes to teething. This is likely due to a combination of the pain the babies are experiencing, lack of sleep, and potentially loss of appetite. Some teething babies lose their appetite and interest in food, because chewing hurts. 3-7 months – During the period from 3 to 7 months, your baby will likely start the teething process. However, keep in mind, there is no reason to worry if your child does not start teething until closer to 12 or 14 months. The first tooth to pop is typically one of the front lower teeth. The second of the bottom lower teeth in the middle of the mouth will likely follow suit. 8-12 months – Depending on when your child begins teething, the next set to come through are the top two front teeth. Typically these will come in between 8 and 12 months and nearly always follow shortly after the bottom teeth. 9-16 months – After the top and bottom sets of teeth, the next set to come through are the lateral incisors, the ones on either side of the top and bottom sets of teeth. Usually the top two appear first, followed by the bottom two. 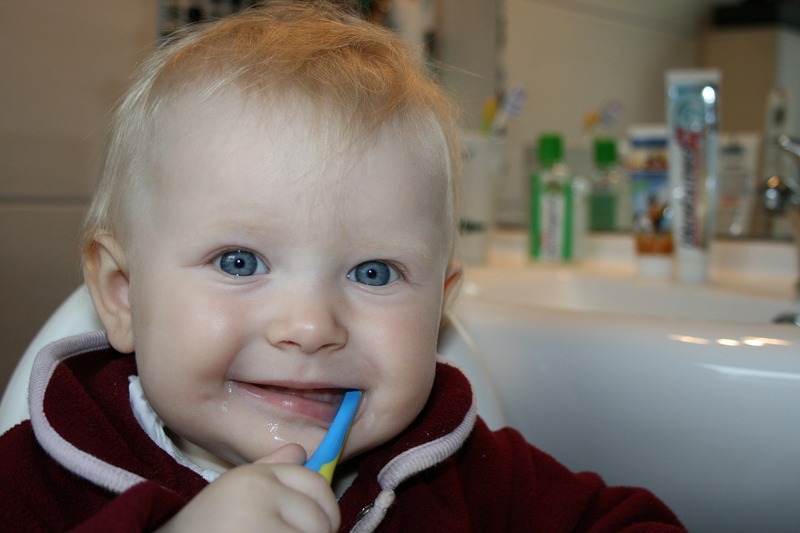 13-19 months – Following the front set of teeth, you can expect your baby to start getting their first set of molars. This typically takes place shortly after they turn one. Usually the molars appear on the top first, followed by the molars on the bottom. 16-23 months – After the molars, the sharp pointy teeth on the top and bottom, known as the canines, will come next. There are two on the bottom and two on the top; usually the top canines come in first. Anecdotally, parents note these are some of the most painful teeth to come in for your babe. 23-33 months – Between your kid’s second and third year, the final set – their second molars – should make their way in. In all, you can expect 20 teeth – ten on the top and ten on the bottom – in your toddler’s mouth. You can provide teethers to your children to chew on to relieve some of the pressure. Some babies especially enjoy the chilled teethers, as they cool their gums and feel good in their mouth. Some babies find relief in chewing on solid foods that also relieve some of the pressure on the gums. Offer your baby a variety of solid foods and see if any strike their fancy. There are several over-the-counter remedies, such as kids Tylenol and Children’s Motrin, that can help relieve the pain and help the baby sleep. As your newborn grows and begins the inevitable transition into teething, hang in there! We promise it will pass quicker than you think, and you’ll be onto something new and exciting soon. Remember every inch from small to tall!